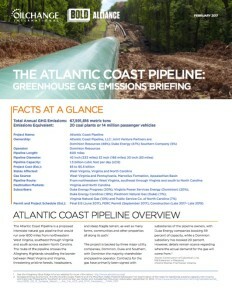 Launching a series of briefings on the Greenhouse Gas emissions impact of Appalachian Basin gas pipelines. We estimate the full lifecycle emissions of building and operating the proposed Atlantic Coast pipeline and provide a critique of the Federal Energy Regulatory Commission’s climate impact assessment in its draft environmental impact statement. We find that the Atlantic Coast pipeline would lead to annual emissions of nearly 68 million metric tons of carbon dioxide equivalent. This would be like adding 20 coal plants or 14 million passenger vehicles. The Atlantic Coast pipeline Greenhouse Gas Emissions Briefing is based on Oil Change International’s Gas Pipeline Climate Methodology. violent weather that is occurring everywhere. the well being of all people is compromised.